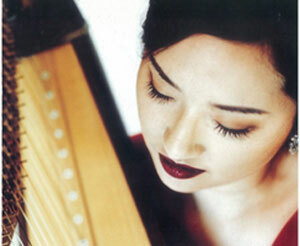 Kyo-Jin Lee began her harp studies at the age of ten. At age eighteen, she won First Prize at the Korean Music Association Competition and began to concertize extensively in Korea. She graduated from Seoul National University, where she also completed her Master’s Degree. From Indiana University Jacobs School of Music, Ms. Lee received her Artist Diploma and Doctor of Music under the tutelage of Susann McDonald. She has been the first Korean to win Third Prize in both the Thirteenth International Harp Contest in Israel and the Fourth USA International Harp Competition. She also became the only person to win First Prize in the Indiana University Concerto Competition for two consecutive years. She has given masterclasses and concerts in various cities such as Seoul, Seattle-Tacoma, Paris, Jerusalem, Prague, Geneva, San Francisco, Urbana-Champaign, and Vancouver. She is currently teaching at Yewon School, Seoul Art High School and Seoul National University.